October Freebies — over $300 of free things we use all the time! It’s one of my favorite months of the year!! The time of the year when things *finally* start to cool down here in Texas. Praise the Lord. This month the promos are COMPLETELY AMAZING. These are not all caps for play… They blow me out of the water especially because there were several things on this picture in my cart that I now get to take out and choose something new. YL knows what we need and when! AND almost $400 of product FREE for a $400 order? Ummm yes please! Better still, during October they added an exclusive Seed to Seal® collection! By reaching 400 PV, you’ll receive the Seed to Seal® Story Collection that features a one-of-a-kind bundle of 5-ml Lavender, Peppermint, and Tea Tree essential oils. WHAT?? I want that! What do you get for free this month? Invite comfort and familiarity into your home with Young Living’s most recognizable and celebrated aromas: collection-exclusive 5-ml Lavender, Peppermint, and Tea Tree. Learn more about our meticulous sourcing, groundbreaking science, and powerful standards with a beautifully designed insert. You’ll be inspired by the legacy created by Young Living Founder D. Gary Young and carried on by CEO and Co-Founder Mary Young. This is so cool! 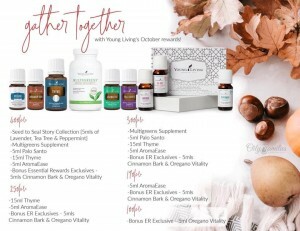 Not only is it gorgeous and includes oils that every house needs, but I love that it is all about the spirit of YL and our awesome seed to seal products. Take these capsules—made with spirulina, alfalfa sprouts, barley grass, bee pollen, eleuthero, and Pacific kelp—an hour before deliciously rich meals. These are a must have in every home and were one of the items I was already ordering. I like taking these because I feel like they give me energy, but the main reason- they give me the greens I KNOW I don’t get in my diet. Also, in my kids’ diet. The day I learned about opening the multigreens capsules in our smoothies was a game changing day. I do this ALL the time now! Cleanse the atmosphere with Palo Santo before family and friends arrive. This sweet, woodsy aroma will warm up any space where moments are shared and memories are made. Dilute 1 drop of Palo Santo with 1 drop of V-6™ Vegetable Oil Complex for a massage that feels and smells like a day at the spa after a day full of physical activity and family fun. This one smells so amazing to diffuse! It also has so many other benefits and I encourage you to pull out your reference guide or app and check them out! My favorite way is to drop this in my salt bath! Unwind with a massage after a long day full of pumpkin decorating and fall baking. Dilute 1 drop of Thyme with 4 drops of V-6 and rub deeply into muscles and joints. Create scent memories with loved ones by diffusing a drop of Thyme with Eucalyptus and Lime. Gathering will be extra sweet as you enjoy the season of giving! Fall cooking is made even better with this oil too! Add a drop or even a toothpick with with even less (a little goes a long way in your cooking) to a dish to make it super yummy! Make your home the center of comfort by diffusing AromaEase. Its blend of Ginger, Peppermint, and Fennel essential oils is the perfect aroma for post-feasting relaxation. Dilute 1 drop of AromaEase with 1 drop of V-6 and rub onto your abdomen. The warm aroma will help you find contentment as you unwind in a cozy home with those you love. And if you are pregnant… this is a MUST HAVE for first trimester. Fill your kitchen with the spicy, sweet aroma of Cinnamon Bark. Get started with holiday festivities early by blending it with Orange, Clove, and Nutmeg! Run soapy water down the drain and drop in 5 drops of Cinnamon Bark and 3 drops of Lemon to freshen a musty-smelling garbage disposal after dinner dishes. Infuse a bottle of olive oil with 15-20 drops of Oregano Vitality. Mix it with vinegar on a small plate and dip in crusty bread to make an easy appetizer. Impress family members and guests with your home cooking. Add life to salad dressings and marinades by adding a drop or two of Oregano Vitality. It’s going to be an amazing month!! Who is grabbing that special 400PV collection?? I know I am! !